This coming summer the Oude Kerk is presenting the most recent monumental work by Giorgio Andreotta Calò (b. Venice, 1979). Calò has devised a site-specific work that effects a drastic alteration to the church’s interior. 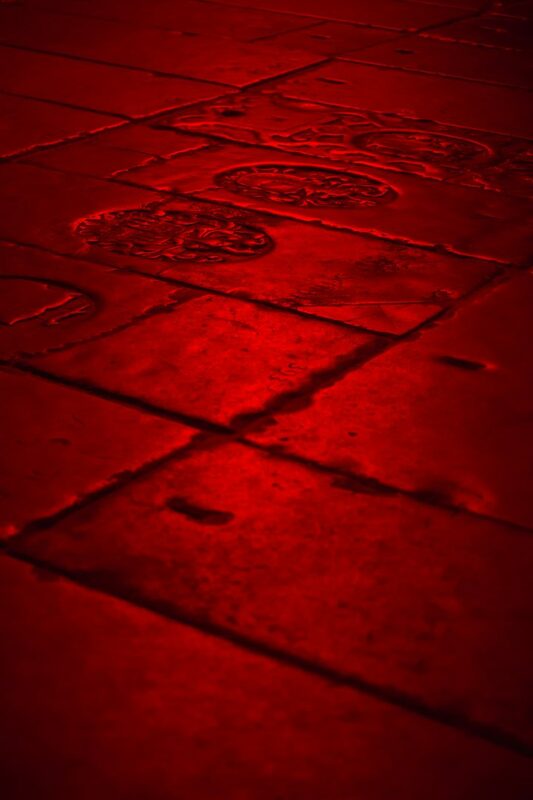 During the summer months, visitors to the church will be bathed in an ocean of red light, an inimitable experience. Late in the evening the red light is emitted from the church, coalescing with the red lamplight of the plentiful brothels and prostitution windows surrounding the church. Throughout the summer the church shares in this light and shade: interior and exterior circulate around each other, to the rhythm of sunlight and its inversion. With the red light Calò brings the Roman Catholic visual idiom back into the building and reflects on the Iconoclastic Fury of 1566 and the revolution in religious thinking. It is like a flashback to the Roman Catholic era that preceded the ‘Alteration’ of 1578, when Amsterdam’s Protestants deposed the Catholic city government and parish churches and chapels passed into Protestant hands and were given new names. Ever since, the city’s oldest parish church, the Church of St Nicholas, has also been known as the Oude Kerk – the Old Church. During the exhibition the artist will be using images of the only surviving Catholic stained-glass window, a depiction of the Death of the Virgin Mary, as the point of departure for a new photographic work, to which the Rijksakademie state academy of fine arts is also contributing. The red light does not affect the undeveloped image and provides the same conditions as in a photographic darkroom. The church will serve as studio and darkroom throughout the summer. The Oude Kerk (a building started in 1306) stands in the midst of the bustling and hectic Red Light District, which with its narrow streets, never-ending hustle and throngs of tourists can have a well-nigh oppressive effect. Once inside the church, it can seem like you are in an oasis of calm, space and history. The monumental glazed windows are one striking feature. In the Middle Ages these were filled with stained glass, so the light penetrated in myriad chromatic variations. The majority of the Oude Kerk’s stained-glass windows were destroyed during the Iconoclastic Fury of 1566, as the Calvinists preferred a stripped-back profession of faith, with little room for imagery or warmth. The colour red largely disappeared and the new glazing in blue, grey or green hues cloaked the interior in a cool light, as it still does today. The work of Giorgio Andreotta Calò offers a novel insight into this history. Giorgio Andreotta Calò (b. 1979) belongs to a generation of artists who endeavour to use an analysis of the past to explain the political and social present. With his intuitive and organic methodology he commingles historical narratives and subsequently conjoins them by means of a ritual performance or physical act. Calò is uniquely adept in morphing the physical, symbolic and spiritual, thus creating experiences that emotionally affect the art connoisseur as well as the non-expert. His residency at the Rijksakademie state academy of fine art (2009/2011) was pivotal in his work’s development. At the Venice Biennale in 2017 he created a monumental work in the Italian Pavilion. In 2012 he exhibited at MAXXI, Rome, and in 2011 he first participated in the Venice Biennale, which involved him walking from Amsterdam to Venice. The last time Giorgio Andreotta Calò’s work was shown in the Netherlands was in a solo exhibition at the Smart Project Space (now closed) in Amsterdam in 2012. Giorgio was nominated for the Volkskrant Visual Art Prize and his work can be found in several Dutch collections, including that of Stedelijk Museum Schiedam. Want to know more about Anastasis? Book a tour via educatie@oudekerk.nl. More information on oudekerk.nl/en/education/. This exhibition was made possible thanks to the support of the Amsterdam Fund for the Arts (AFK), the Italian Council, the Mondriaan Fund, and the Rijksakademie van beeldende kunsten.